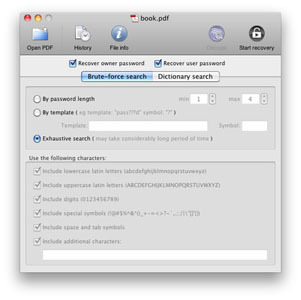 PDF Password Unlocker for Mac recovers passwords for PDF files in case they were lost or forgotten. It unlocks both user and owner passwords for PDF files. So you will be able to open password-protected PDF, print, edit and copy it. If your PDF file is protected only with owner password you can use "Decrypt" option and create an unprotected copy of PDF file even without searching for the password. This program features various methods of passwords recovery: by password length, by template, by dictionary, and exhaustive search method. Dictionary search is the time-saver in case you can remember that the password is a word or a word combination or modification. PDF Password Unlocker is optimized for efficient work on multi-core computers for higher password search speed. It supports all versions of Adobe Acrobat up to version 9. PDF Password unlocker for Mac can recover Unicode passwords and passwords created in various languages and keyboard layouts. Recover PDF Password can also remove digital signature for your PDF file.